November 2018 Taiwan International Machine Tool Show (TMTS) to highlight island nation’s capabilities in aerospace machining. 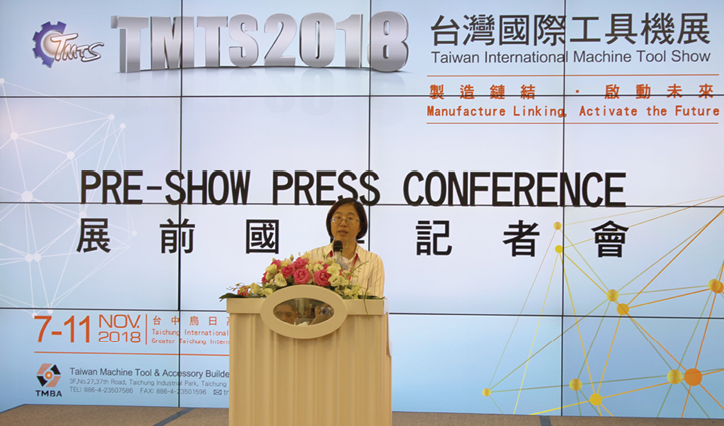 Elisa Li, vice president of the Taiwan Machine Tool & Accessory Builders Association (TMBA) discusses the Nov. 7-11, 2018 TMTS2018 trade show at a press conference in Taichung, Taiwan. Li says the show will be significantly larger than the 2016 outing with more exhibitors from North America and Europe reserving booth space. 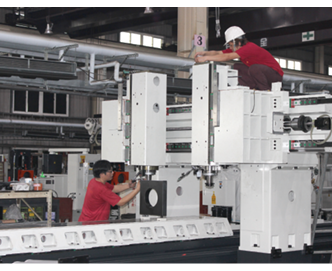 Falcon Machine Tools Co. Ltd. employees build a Chevalier double column vertical machining center (VMC) at the company’s Taichung, Taiwan, plant. Sales Manager Brian Chen says the company’s largest machines are most popular with aerospace companies producing large, monolithic components. With machine tool sales increasing, especially to targeted aerospace and automotive customers, Taiwan’s machine tool makers are eager to gain more attention for their systems on a global stage. Following a big presence at Hannover Messe in Germany in April, and with several exhibitors expected to display in Chicago from Sept. 10-15, 2018, at IMTS 2018 – The International Manufacturing Technology Show, tool builders are hoping to draw even more international attention to the Taiwan International Machine Tool Show – TMTS2018, set for Nov. 7-11, 2018 in Taichung. A technician at Chevalier’s Taichung factory builds a high-speed spindle in a temperature-controlled room. While some machine tool companies in Taiwan buy spindles from European and Japanese manufacturers, Chevalier and others build their own. The TMBA recently invited editors from several international manufacturing publications to tour Taichung manufacturers prior to TMTS2018. With 90% of the island nation’s tool builders concentrated within a 40-mile radius of Taichung, manufacturers say the tooling cluster offers huge advantages.